Two connectors - a micro USB for your smartphones/tablets and a USB3.0 for your PC/Mac. With two USB connectors, you can now have a flash drive to work with both your PC and mobile device*. * Smartphones or Tablet PCs must support USB On-The-Go (OTG) feature. 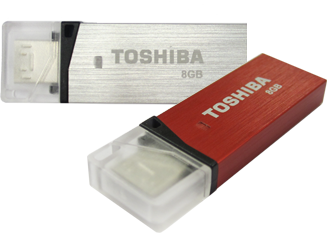 This USB Flash drive may not fit into tight micro-USB port locations on certain Smartphones or Tablet PC models. 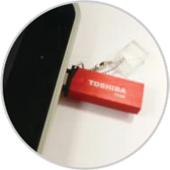 When the micro USB2.0 is plugged into a mobile device, the contents of the flash drive can be viewed instantly, without the use of laptop or desktop. 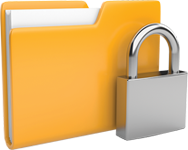 Preloaded with password protection software*, it keeps important and private data protected. Does not require any internet connection, power supply or apps to work. * Works on PC only. 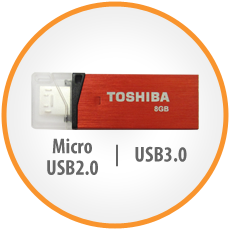 Sleek in design and so compact, the Toshiba Micro USB3.0 Flash Drive Duo is convenient to bring with you, anytime, anywhere.